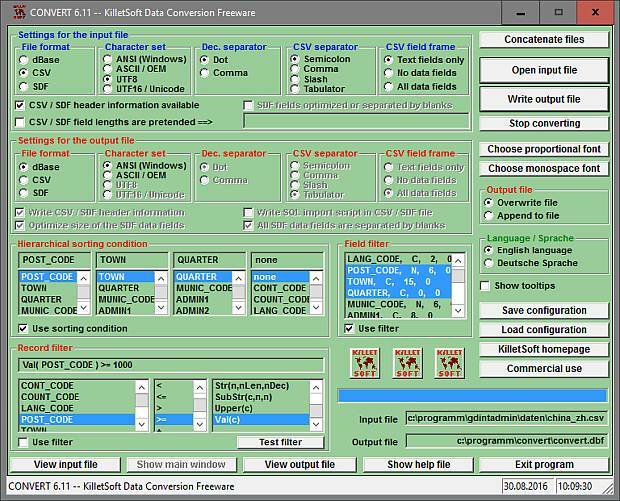 The freeware program CONVERT from KilletSoft converts data files to other data formats and character sets. For the import in MySQL or SQL databases the 'CREATE TABLE' script can be generated. Thus the import of the data in any data base management system or file system will be possible. Conversions between this data formats are possible: CSV (Comma Separated Value), SDF (Simple Document Format), dBase (Borlands data base format). Conversions between this character sets are possible: ANSI (American National Standards Institute) [single byte WINDOWS standard], ASCII (American Standard Code for Information Interchange) [single byte character set], UTF8 (Unicode Transformation Format) [multi byte character set], Unicode (Universal Character Set) [double byte character set]. A special feature of the program is the possibility to process CSV and SDF files that are larger then 4,3 gigabytes. All data can be selected on the contained data fields. Data from dBase tables can also be selected on data records and can be resorted on base of the data fields. Data from several dBase files can be joined to a common file. The program can be controlled by the user interface (GUI) or by calling it from the command line. When called from the command line the names of the files must match the OS conventions and the file formats. For multi file processing the wildcards '*' or '?' can be used in the file names. With the button 'Save configuration' a configuration file with the current settings is produced, which later can be used, when entering the program from the command line. The configuration file has always the file extension '.ccf' (CONVERT configuration file). A help file contains global information to the program in form of an program intern electronic manual. The English or German language help can be called with the "Help" button while the program is running. The freeware program can be downloaded from the Internet site of KilletSoft. Recent Changes: CSV data fields may contain field separators and field delimiters. The DataViewer supports UTF8 and UniCode. Digital signature for secure installation of the program. Program control from the command line. Record selecting and data sorting. Character sets ANSI, ASCII, UTF8 and Unicode. Fast and easy net and gross amounts calculation. Conversion between different measurements of bits and bytes. Mortgage Calculator is a program for calculating mortgage repayments.